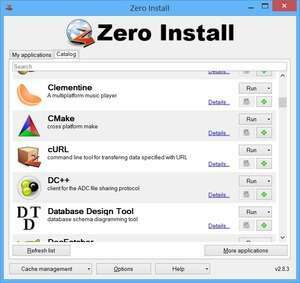 Zero Install is a decentralised cross-distribution software installation system. Other features include full support for shared libraries (with a SAT solver for dependency resolution), sharing between users, and integration with native platform package managers. It supports both binary and source packages. For security reasons, you should also check out the Zero Install download at LO4D.com which includes virus and malware tests. Additional screenshots of this application download may be available, too.